Centro gara: nei pressi di Oristano. Aeroporto più vicino: Cagliari. 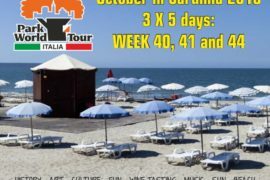 Week 40, week 41 and week 44 will take place in the extraordinary region of Sardinia. The island of Sardinia lies west of the Italian mainland, surrounded by the Mediterranean Sea. Sardinia’s population of 1,700,000 lives in an area of 24.000 km sq, divided into 8 provinces; the main are: Cagliari (island’s capital city), Oristano, Nuoro, Olbia and Sassari. The waters around Sardinia are considered to be the cleanest in Italy and reach of flora and fauna. Nuraghe is a special building, symbol of Sardinia, consisting in a truncated cone, dating back to 1800 years B.C. In Sardinia there are over 7.000 nuraghi, often displayed in several Archaeological museums. 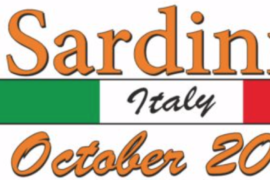 For you, we planned 3 extraordinary 5 days, with stages in historical centres/in the beautiful forests, where you can explore the heart of Sardinia, and both east and west coast. In the middle, near us, there is the “Gennargentu National Park”, the most mountainous landscape of Sardinia, which includes the Island’s highest peak, Punta la Marmora 1,834 m. Gennargentu means “door of silver”. 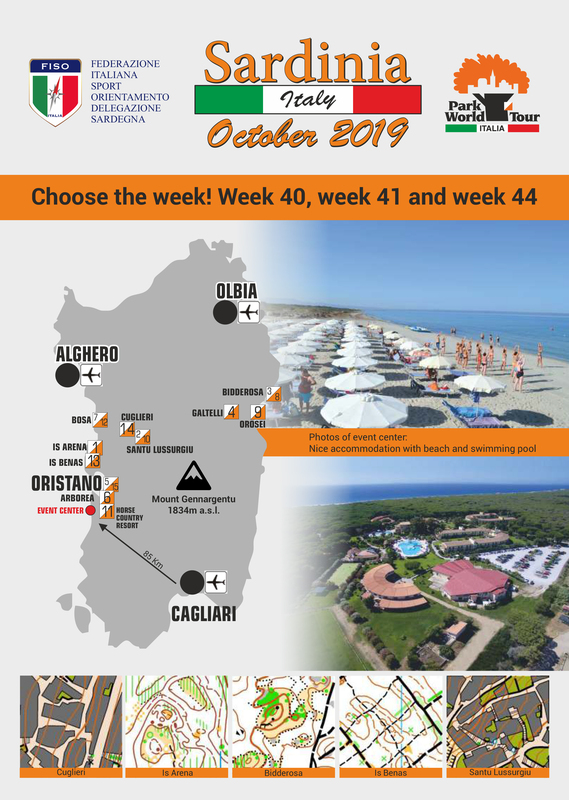 The orienteering event centre will be located in Arborea, next to Oristano, 85 km driving from Cagliari airport, at the 4 stars resort Horse Country, with free use of a big swimming pool, private beach, tennis and soccer fields. We chose a bed & breakfast formula in order to leave more freedom of choice for lunches and dinners. Many opportunities of different dishes in restaurants and bars inside resort Horse Country! You can enter the races only if you book accommodation through us! The 5-days entry fee includes: 1 street music-party per week, 1 wine/food tasting per week, 1 official gadget, 5 orienteering races. The official gadget of the event will be given only to those entering before 15th Sept. Kids course, MW10, MW12, MW14, MW16, MW18, MW20, MW21, MW35, MW40, MW45, MW50, MW55, MW60, MW65, MW70, MW75, MW80, Open short (good for beginners, men and women in the same category), Open Middle (as W50/M60, men and women in the same category), Open long (as MW40, men and women in the same category). Daily direct courses: short, middle, long. Entries at race site. If very few entries, organizers will merge the classes. Rental Sport-ident card: 20 euro /week or 5 euro / day for +21y.o. + deposit of 30 euro. 10 euro /week or 3 euro / day for up to 20y.o. + deposit of 40 euro. Changes of Si-card or category/class during event: 5 euro. Prizes to winners of each stage and for the best 3 in each category overall.